Banaba is a raised coral island with less than 300 inhabitants on its 6 square kilometres. it is prone to drought as it has no natural streams and in the 1870's a three year drought decimated three quarters of the population. 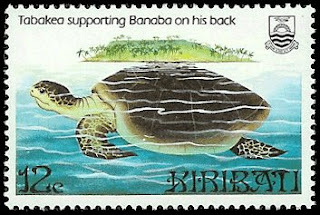 there was a legend that Banaba was perched on a great column of rock and supported by the turtle god. or that the turtle god, Tabakea, lived in the great darkness with several other gods including Auriaria the giant who pierced the heavens with his staff when he became lord of the darkness and the rock (Banaba means 'rock') fell into the sea, landing upside down trapping Tabakea the turtle underneath. a tradition on Banaba was the capturing and taming of frigate birds. they like to perch in high trees which makes it impossible to catch them there, so the birds have to be caught while flying, which is quite challenging as they are very strong flyers, staying up high only coming down towards land when they see food. they usually fly in groups with some colonies being up to 1,000 birds. there is a lot of skill involved in catching these birds - a weight made of stone or metal that is perhaps the size of a man's thumb is attached to a long string of coconut fibre and thrown like a lasso so that the weight is caught around and under the wing. you have to be careful not to hit the body of the bird or it might be injured or killed. the birds are then tethered to the village perch where they are tamed. these birds aren't caught for food and once tamed, they tend not to leave the island. Kiribati is the only country that lies in all four hemispheres. Apart from Banaba, there are also 33 atolls and reef islands. The land mass is 800 sq km, but it is stretched but over 3.5 million sq km! The international date line swings out to the east so that all the the islands are in the same time zone, which is UTC +14 so, the first place to see the sunrise and the new year! Clever to choose this country - I didn't know there was one in all four hemispheres. 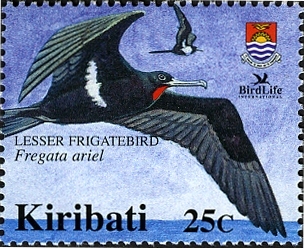 Fascinating story about the frigate bird - and a stunning stamp to go with it. The bird stamp is my favorite. though I love birds, I'm partial to the turtle in this instance. Kiribati sounds exotic to me! I don't have any stamps from that place so happy to see these two here on your page. Thanks! I can see we might get into a discussion on how a country can lie in all four hemispheres. I suppose what you regard as the hemispheres might be determined by where you are situated. Nevertheless the turtle story is great and the frigate bird is magnificent. The animal ones are always my favorites. Fascinating history and beautiful stamps -- not fond of the idea of catching wild birds, but I will respect their tradition. Can you imagine living on that small island with only those many people? That's as amazing to think about to me as the fact that it lies in four hemispheres. Fascinating.